Time Shifter that has power over plants. Leafy-Con is a cross between a rose and a dragon that can breathe fire and her head is hard like diamonds. 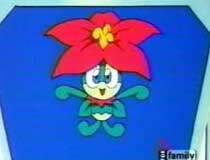 She also can turn into Leafy-Master which looks like a pink flower and attacks with pollen. Founded in the time of young King Arthur.